Jakubina, 2194m, is the second highest peak in the western Tatras and one of the most prominents. 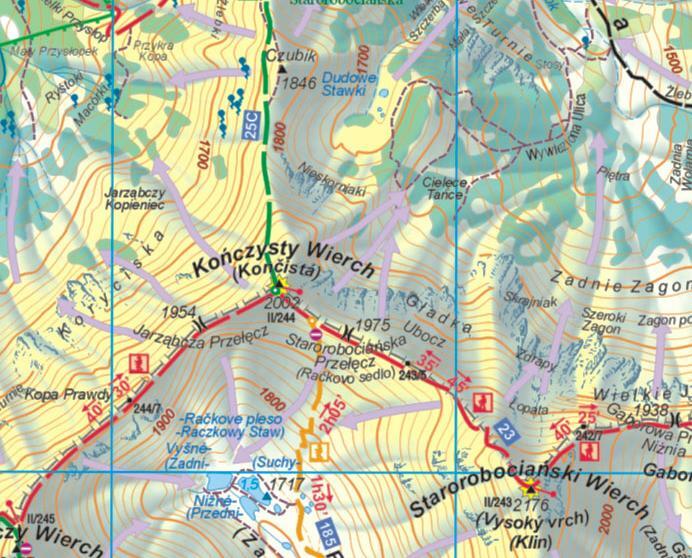 The top lies entierely in the Slovak territory, but very close to the polish border, to which it joins at Jarząbczy Wierch, which is rather the continuity of this mountain than another top. It separates on the slovak side the 2 valleys of Dolina Jamnická and Račková; on the North, behind Jarząbczy Wierch, the eastern half of the valley Dolina Chochołowska. Its name probably comes from a village called Jakubovany, near the foothills of Baranec. This one is named after its protector - Saint Jacob (Jakub), and the peak is probably named after this village from which we see it: Jacob´s Mountains. In Polish, this peak has a different name, "Raczkowa Czuba", from the valley's name in Slovak. As seen from the South, especially from Pribylina, Jakubina presents a strange complex shape, almost terrifying, with rocky prominences looking like the backbone of some dinausaur; an invitation for the hiker looking for an entertaining ridge-walk. "Otrhance" is the name of this ridge. However, the ridge of Jakubina is not from far the most visited in the western Tatras, and like Baranec, it is a place where one can savour the tranquility and observe frequently some chamois. It all depends from which side you plan to ascend the peak. However, Jakubina is served by many very convenient official trails so that offtrails is not really required, and I discourage one to try, it would be a very stupid way to get fined. There are 3 ways to visit Jakubina making a loop, 2 of them from Slovakia and one from Poland since 2008 (thanks to Schengen). Start from Pribylina campsite (blue trail) by the ascent of Jakubina (green trail), and continue north from the top until Jarząbczy Wierch ("Hruby Vrch" in slovak). Return is made by the descend in the valley Jamnická Dolina. The circuit is best-made in this direction (storms), unless you plan to sleep at Koliba pod Pustým the evening before. Start from Pribylina campsite (blue trail) by the ascent of Jakubina (green trail), and continue north from the top until Jarząbczy Wierch ("Hruby Vrch" in slovak), Konczysty Wierch, and the pass Rackovo Sedlo. Return is made by the descend in the valley Račková Dolina. The circuit is best-made in this direction (storms), unless you plan to sleep at Koliba pod Klinom the evening before. This is a big hut and generally finding a place is not too hard. Take duvet and mattress anyway during sunny week ends when there is a lot of people. - Koliba pod Klinom is another very good hut, located in the upper part of the Račková Dolina, at the junction of the yellow and green trails. This hut is very small but the location is very nice, over the tree line contrary to Koliba pod Pustým.